Elle est tres controller mais elle mange trés bien tous les jours. Elle mange beaucoup des fruits et des legumes mais elle ne mange pas le poisson. elle est en bonne santé parce qu’elle mange assez de fruits et de légumes. Elle aime beaucoup des tomates et elle aime le Kiwi mais elle ne mange pas beaucoup de variété des legumes et des fruits. Elle est un mangeur difficile mais elle mage beaucoup et elle aime le cuisine de japonais. A mon avis, tu as besoin de manger du poisson et des féculents parce que c’est bon pour toi. Aussi tu as besoin de manger plus a l’ecole parce que tu es fatigué pendant la jour. Tu manges trop de tomates et du bœuf mais pas assez de variété. Tu as besoin de manger du poisson et du pain trois fois par semaine et tu as besoind de boire du lait pour calcium supplémentare. Aussi, tu as besoin de boire du caffeine boit pour s’assurer que tu nêtes pas fatigués. Factual How can I remain healthy? What is a healthy lifestyle? How does food reflect our culture? To remain healthy, I would suggest eating a variety of vegetables, fruits, meats and more. It is suggested that in order to stay healthy you need to keep a balanced diet where you eat a variety of foods and receive the correct amount of protein, carbohydrates, and more in order to feel your best. Excercise, good amounts of sleep, and staying active in the outside world can help boost your emotions and make sure that you are healthy and feeling your best at all times as they ensure that you are ready for the day ahead. It is crucial to have a constant positive attitude and strong motivation to stay healthy as it will make sure that you have a more sustainable and enjoyable lifestyle. Our food reflects our culture as based on where we are from, there are different tastes, colours, and flavours and through this, it can show the emotions of culture, attitude, and supposed spiritual foods. Food can represent our cultures through the colours as it can help show emotions and teachings of religion as bright may suggest happiness or holy spirits or dark may suggest sadness and evil, as well as colours, can represent the intensity, and culture can influence your taste to better fit what you can get from where you are from so that you are receiving the right nutrition. Conceptual Is our diet influenced by our culture? Our diet is influenced by our culture as because depending on where you are from, the different foods you will grow up to eat, and therefore you will be more adjusted to the taste of your nation. In different nations and cultures, different foods are available and for that reason, we have to adapt to what we can get and that will still give us the correct nutrition and vitamins in order to keep us bright and happy during the day. Our diet can be influenced by availability in cultures as well as through teachings as some foods may have myths about them and therefore you are encouraged or discouraged to eat those foods as they could be thought to bring you different kinds of luck or fate. I think that this statement is not true almost at all as you can eat unhealthily and still be happy, as well as you can eat healthily and still be unhappy, it is all about the decisions you make that define who you are, and sometimes what you eat is what you eat because it is all you can eat. From personal experience I know this as I like to have fun and cherish moments and although I do eat healthy and organic food, and exercise, there are occasions when I eat junk food, yet that does not define who I am as it may be because I am in a rush and need quick food, or it is all that is left in the fridge, and for that reason I am not what I eat. There is a life expectancy of 54.7 years old. The official language is French although there are 60 vernacular languages. The leading producer of cocoa for years with more than 45% of the world’s production. 95.4% of children attend primary school. The head of the government is Alassane Ouattara. Independence day is August 7th and it is a national day off. It has an area of approximately 322000 kilometres squared. 70.3 inhabitants per kilometre squared. The 3 main religions are Christianity, Islam and Animism. What types of food products are specific to Côte d’Ivoire? The most common types of foods that are specific to the Ivory Coast are Cocoa, Corn, rice, millet, and yams as these grow best in large amounts under the extreme weather conditions and climate of the Ivory Coast. These foods are all organic and easy to farm as well as manageable and cheap and therefore sustainable, making for a healthy diet providing the nation with the correct nutrition and food for a cheap price as the majority of the population work in agriculture and therefore rely on their crops for money, and cannot afford expensive spices and herbs but instead rely on mass-produced, organic fruits, vegetables, and grains. How are these food products used in the Ivorian diet? The Agni and Abron groups survive by farming cocoa and coffee. The Senufo people live in the country’s northern savanna. They cultivate rice, yams, peanuts, and millet. Rice with a peppery peanut sauce is often enjoyed by the Senufo people. The Dioula of the far northwest depends on their cultivation of rice, millet, and peanuts to survive, while the Kulango people of the north, who are mostly farmers, grow yams, corn, peanuts, and watermelons. Those living near the coast enjoy a wide variety of seafood. Which dishes are specific to Côte d’Ivoire? The national dish is fufu, plantains, cassava, or yams pounded into a sticky dough and served with seasoned meat and vegetable sauce called kedjenou. It is typically eaten with the hands, rather than knives and forks. Kedjenou is most often prepared from peanuts, eggplant, okra, or tomatoes. Attiéké is a popular side dish. Similar to the tiny pasta grains of couscous, it is a porridge made from grated cassava. Give an example of a specific recipe with its picture and the ingredients used. Please provide some background information about this recipe. 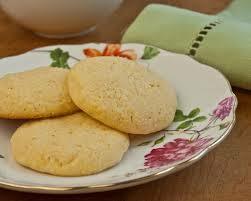 Cornmeal cookies are used to go with different hot beverages and are often used as a little dessert or appetiser to warm up someone in cold weather or in the Ivory Coast’s sake used as a delicacy that is a treat for both children and adults to enjoy on traditional holidays as well as enjoy as a family. They are relatively quick and easy to make as well as taste delicious and for that reason, they are so practical and enjoyed widely by the population of the Ivory Coast. In a mixing bowl, beat margarine and sugar together until light and fluffy. In a separate bowl, combine the flour, cornmeal, salt, and baking powder. Slowly add the dry ingredients to the margarine mixture and mix well. Drop dough in spoonfuls onto a greased cookie sheet and bake for 15 minutes. The Ivorian diet is a healthy diet as it consists of many natural flavours as well as organic fruits and vegetables grown there in Ivory Coast. Ivory coast is big on agriculture and for that reason, their food is extremely fresh and organic to eat, lifting your mood, and providing your body with the correct nutrition and vitamins to keep you going throughout the day. Being the worlds largest producer of Cacao, you can tell that a lot of their fruits and vegetables are quite exotic and favourable, and wide in variety, therefore providing you with different tastes, and making sure that your tastes buds are always alive. Ivory Coast has a good balance of sweet recipes and savoury recipes as well as know how to balance their diet well, keeping them strong to carry on during the day and withstand the humidity. Answer to the conceptual question: “Is our diet influenced by our culture? In other words, how much the Ivorian culture has shaped its diet. For example, did you find that as a former French colony it has adopted some French food products or adopted the French way of eating? I think that the Ivory Coast has adopted their own way of living and eating in the modern day as they now understand different ways of farming and have adapted to better fit their terrain. Saying this, they have adopted some techniques in agriculture and cooking in order to add diversity and skill to their foods while also ensuring that the nutritional value of the foods is made the most of and that food does not go to waste. Also saying this, many of the names are adopted by the French language and therefore use some traditional techniques or materials from the french to add nutrition and flavour to the foods. Give a personal response to the debatable question: “Tell me what you eat and I will tell you what you are” in the context of Côte d’Ivoire. In other words, in your own view how is it important to eat good food in order to be healthy and fit? It is extremely important to eat good food in order to be healthy and fit, although you also have to be active and involved in exercise, receiving the right amount of sleep and work to ensure that your life is never boring and that you can withstand any task that comes your way. Food is one of the main contributing factors to morality, and the better the food, the more likely you are to be happy, as if you are receiving the correct nutrition to keep you going and you are enjoying the food, it will provide incentive to stay healthy and make sure that you are involved with the real world and out in the fresh air instead of sitting inside alone. I think that when food is diverse and complex it provides the desire to try out more foods, and really gets people out and trying more natural and diverse flavours which when translated into our daily lives, allows people to be more risk takers and try to go outside of their comfort zone. Réponds aux questions suivantes sur Sympa, la famille! 1. What are Isabelle and Thuy talking about? 2. Does Isabelle have brothers or sisters? If so, what are their names? 3. How many cousins does she have? 4. Who are some of the other family members she mentions? 5. How does Isabelle feel about her family? How can you tell? 1) They are talking about Isabelle’s family and their personalities, and what they like and don’t like. Also Thuy was saying that she is an only child and she likes looking through photos. 2) Isabelle has 1 brother whose name is Alexandre. 3) Isabelle has 3 cousins: Loïc, Julie, and Patricia. 4) Her grandparents, uncle and aunt, parents and pets. 5) I think she loves her family although at times they can be stubborn and her brother can be annoying. Est-ce que la famille d’Isabelle est comme les familles que tu connais? Est-ce qu’elle est différente? Pourquoi? Dans ma famille Il y a six personne. Il y a ma mere, mon pere, mes freres et ma sœur. J’ai aussi un chien Qui sappelle Boodles. Ma mere, qui sappelle Katherine est tres gentille et aimable mais elle est un peu bavarde. Mon pere, qui sappelle Ceri est gentil et aimable aussi mais il est tres confiant. Mes freres sont tres amusants et genereuses. Ma sœur qui sappelle Hafren a onze ans. Elle est tres intelligente et aimable mais elle est un peu égoïste. Enfin mon chien! Elle est adorable et tres tres mignonne. Ma famille est sensationnell. Ma famille est differentes parce qu’il n’est pas ennuyeux et ils adorent les animaux domestique mais la famille d’Isabelle est un peu ennuyeux et son pere n’aime pas les animaux domestique. This is the work we did on our online textbooks in French. This is my french name and my french name birthday is the 12 Julliet the 12th of July. This is my French Wordle with words that I recognise that are french.